China, the most populous country in the world, has developed an e-commerce system that is in many ways distinct from the system established in Europe and North America. Understanding the difference is essential for the smooth development of this new channel of distribution, namely e-commerce. Chinese e-commerce platforms are very good examples on how to exploit development in technology, not only to create value for the operators but also contribute to structural changes in the Chinese economy, boosting internal consumption. The success of Alibaba is unique because of the characteristic of the Chinese market and consumers. Their imminent IPO, at or exceeding the offer value of Facebook, will attract more attention to e-commerce in China as a new method to establish a presence in this market. Chinese companies, e-commerce or not, are eager to expand their presence abroad, and they will adopt a more aggressive approach to participate more in the EU through acquisitions. progress towards a freer and more secure cyberspace in China. An appendix presents English texts of essential Chinese legislation affecting e-commerce. As a full-fledged definition of this new channel of distribution, its boundaries and functioning, with a particular focus on China, this book is an indispensable source of guidance and reference for counsel representing global marketers at any level of business. Its importance for scholars and researchers in the critical field of data security goes without saying. However, this book is also a guide for all the enterprises wishing to do business in the online dimension in China, and for all the consumers shopping online, wishing to know what their rights are when buying products or services on the Internet, and to know how to protect themselves if something goes wrong. Chapter 1 The Emerging of E-commerce in China, Its Contribution to Fostering Internal Consumptions and the Impact of the Internet on Our Society. Chapter 2 Concluding Contracts Online: A Comparison with the EU System and International Initiatives to Foster E-commerce. Chapter 3 Privacy and Data Protection in China when Contracting Online: The Current Situation in the Main Land China and the EU Model. Chapter 4 Online Payments or E-payments and the Potentiality of the Industry for Operators. 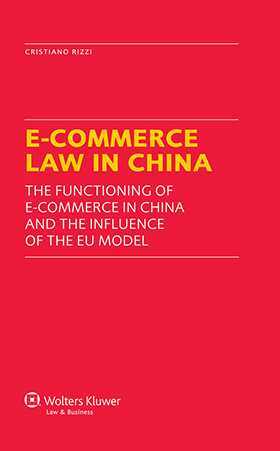 Chapter 5 Jurisdiction and Choice of Law: Their Relevance for E-Commerce. Chapter 6 The Importance of Online Marketing and Dimension of China’s Advertising Market. Chapter 7 Protection of Intellectual Property Rights (IPRs) on the Internet. Chapter 8 Computer-Related Offenses: Internet Frauds and the Other Risks when Acting Online. Conclusion. APPENDIX I Interim Measures for the Administration of Online Commodities Trading and Relevant Services. APPENDIX II Several Provisions on Regulation of the Order of Internet Information Service Market. APPENDIX III National People’s Congress Standing Committee Decision concerning Strengthening Network Information Protection. APPENDIX IV UNIONPAY Rules (Electronic Payment Guidelines).